Just a little bit of new yarn…..
I’m doing simple relaxing things this week after all the excitement and activity of Stitches West and my Trunk Show. Both events were great and fun and exhausting. Everything seems to come at once! So far this week I’ve done the laundry, went to the grocery store and oh… posted a tiny bit of new yarn. (Select Single) Really there is just a little of this. Its the 2012 club yarn dyed in an assortment of colors. Its something new for me, a single (ply – one strand) alpaca/wool/silk blend. I don’t usually like singles but this one holds it shape and has just the right amount of twist. It also has SILK in it – how can you go wrong with silk???? Both alpaca and silk are long strong fibers, they blend well together, no short ends poking their way out of the yarn, they compliment each other. The crimpy wool adds loft to the otherwise dense and straight alpaca/silk blend. 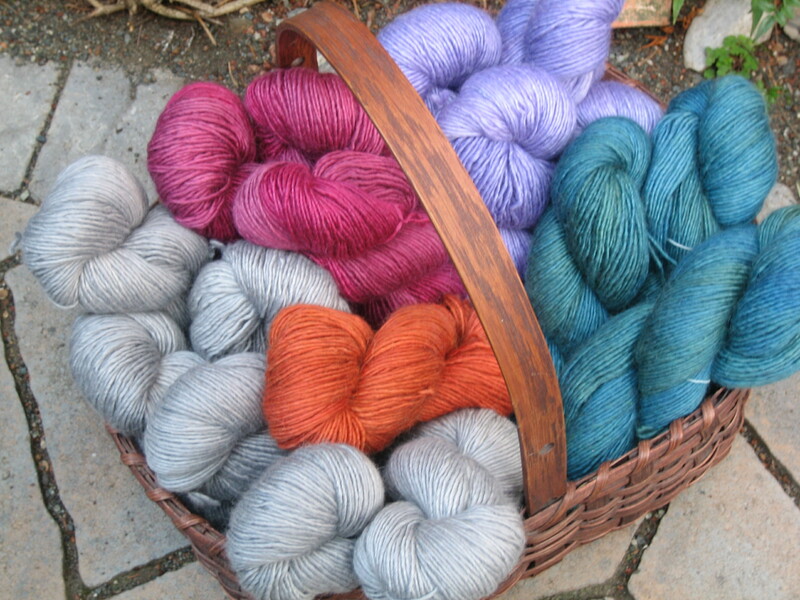 The resulting yarn is soft, strong, shiny and just plain lovely!